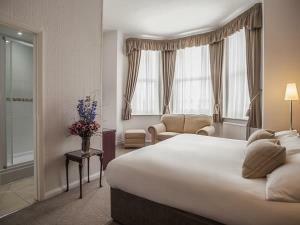 Devonshire Park Hotel sometimes limits bookings to 2 or more days. An en-suite Classic Double Room - 1 x King Bed - Tea, Coffee & Hot Chocolate making facilities, Hairdryer, Radio Alarm, Satellite TV, DVD and VCR, Direct Dial Telephone. All Bedrooms are now Non-Smoking. An en-suite Classic Double/Twin Room - 1 x King Bed or 2 x Single Beds - Tea, Coffee & Hot Chocolate making facilities, Hairdryer, Radio Alarm, Satellite TV, DVD and VCR, Direct Dial Telephone. All Bedrooms are now Non-Smoking. Double/Twin sometimes limits bookings to 2 or more days. An en-suite Double/Twin Suite - 1 x SuperKing Bed or 2 x Single Beds - Tea, Coffee & Hot Chocolate making facilities, Hairdryer, Radio Alarm, Satellite TV, DVD and VCR, Direct Dial Telephone. All Bedrooms are now Non-Smoking. Suite sometimes limits bookings to 2 or more days. An en-suite Superior Double/Twin Room - 1 x SuperKing Bed or 2 x Single Beds - Tea, Coffee & Hot Chocolate making facilities, Hairdryer, Radio Alarm, Satellite TV, DVD and VCR, Direct Dial Telephone. All Bedrooms are now Non-Smoking. Sup Double/Twin sometimes limits bookings to 2 or more days. 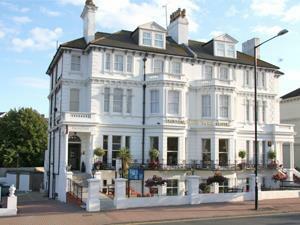 The Devonshire Park Hotel is an elegant Victorian property located in one of Eastbourne's finest positions. In the heart of the Cultural and Theatre District - opposite Devonshire Park, The Cultural Centre and The Congress Theatre - the Hotel is only a short walk to the shopping centre and just 150m from the seafront's main promenade, with easy access to all local tourist attractions. FREE PRIVATE CAR PARK Complimentary Internet Access in Lounge. Wifi throughout. Complimentary Access to DVD Library of over 300 Movies. During our Mid & Low Season Children under 12 years at the Hotel's discretion. During our High Season Children welcome from age 12. From A22 or A27 Follow signs from Polegate, through Willingdon to the Town Centre. Once in Eastbourne follow signs to Devonshire Park and The Congress Theatre. The Devonshire Park Hotel is opposite both these in Carlisle Road.